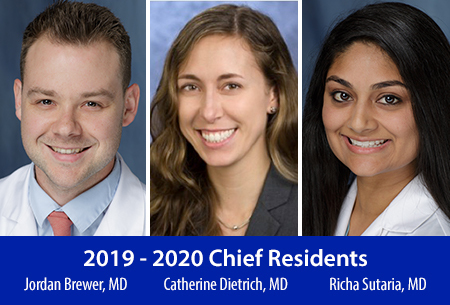 The Anesthesiology Education Office and Department of Anesthesiology Leadership are pleased to announce the selection of three new chief residents who will serve from April 1, 2019 through March 31, 2020. We were extremely fortunate to have eight truly excellent candidates for chief resident this year. Please join us in congratulating Drs. Jordan Brewer, Katie Dietrich, and Richa Sutaria as our new chief residents! Also, please help us to thank our three outgoing chief residents, Drs. Dalya Elhady, Sindhu Nimma, and Kevin Olsen for their time and service over the last year.